Experienced London estate agent Karl Knipe, with over 30 years experience in the industry will be hosting LGR’s new series called ‘The Property Show’. Karl Knipe, partner of Kings Group, which has 15 branches across North London, East London, Hertfordshire and Essex, will discuss a variety of issues each month, ranging from house prices and Brexit, to stamp duty and the buy-to-let market. The six-show series will air on LGR on the first Wednesday of every month, starting in April. The host will be joined by regular guests. Joining him for the first show are Vishal Gulranjani from Thomas Oliver Financial Advisers, Chris Bramham from Metropolis Surveying Services and Roydon Weekes, also from Kings Group. The first 45-minute episode of ‘The Property Show’ will see Karl and his guests give an expert overview of the current property market. “The property market can be complex and is always changing, so it’s important that buyers, sellers, tenants and landlords are armed with the information they need to make smart and informed decisions,” he adds. Marquee Events International Presents STAN Live in London. On Saturday 31st March 2018 STAN will be live at the Country Club with a full Greek band. Ticket prices start from £30 and are available online visit Stanlive.Ltbevents.com, or for table packages please call London Ticket Box on 07904 537 181. Management reserve the right to refuse entry at their discretion. A UK Cypriot teacher based at a school from one of the country’s most deprived areas has won a million dollars in the annual Global Teacher Prize. Andria Zafirakou beat 30,000 others from 170 countries to be crowned winner at the ceremony in Dubai. The art and textiles teacher, who had been shortlisted to the final 10, works at Alperton Community School in Brent, London. It’s one of the UK’s most ethnically diverse and disadvantaged places. Andria Zafirakou was born in London. Her mother, Anna, is Cypriot and her father is Greek who is well known in the community as he is the Reverend Georgios Zafirakou, the priest of the Greek Orthodox Church of All Saints in Camden, London. Ms Zafirakou learned how to say basic greetings in many of the 35 languages spoken at the school, including Gujarati, Hindi, Tamil and Portuguese, to help parents feel welcome and included. The winner of the Global Teacher Prize 2018 faced a daunting task when she joined the school. The challenges of poverty, gang violence and engaging young people from such a diverse range of backgrounds were all too clear. However, throughout the school and on the streets – she is driving change. Her own classroom is just the beginning though. After school, with a walkie-talkie in hand, she’s outside the school gates, getting pupils safely onto local buses and heading off ‘recruiters’ for the local gangs. Gang violence is a major problem in the local area. She works closely with the police to identify potential issues and ‘recruiters’. The fourth annual Varkey Foundation Global Teacher Prize is worth one million dollars (£717,000). An estimated thousand plus London Cypriots paid their final respects to Takis Harmanda, former Sales and Marketing Director, and co-founder of London Greek Radio, on Saturday 17th March 2018. The funeral service was held at St Mary’s Greek Orthodox Church, Trinity Road, Wood Green and officiated by His Eminence Archbishop Gregorios. Takis was later laid to rest at New Southgate Cemetery. The service was attended by Member of Parliament for Chipping Barnet Theresa Villiers, Mayor of Barnet Council Councillor Brian Salinger, President of EDEK Marinos Sizopoulos and Consul General of the Cyprus High Commission Ioannis Koukoularides. Speeches were given by Michael Ellinas, George Michaelides, Kyriacos Theodosiou (Brother-in-Law of Takis Harmanda) and Takis’ daughters Loukia and Eleni. Wreaths were laid by Marinos Sizopoulos (EDEK), Andreas Papaevripides (President of the World Federation of Overseas Cypriots and DISY UK), Christos Karaolis (President of the National Federation of Cypriots in the UK), Mayor of Kerkyras (Kerkyra Council), George Michaelides (AKEL), Andreas Christoforou (DIKO), Ninos Koumettou (Greek Cypriot Brotherhood), Vasilis Panayi (London Greek Radio), Michael Yiakoumi (Parikiaki Newspaper), Nikos Papadopoulos (Eleftheria Newspaper), Vasilis Mavrou (Famagusta Association), Maria Paschali (Manor Hill and Finchley Greek Schools) and Koumis Michael (Ayios Andronicou Association). LGR’s Vasili Panayi fought back tears as he laid the wreath from the station and reached out to touch Takis’ coffin as a farewell gesture, as did many others in attendance. Thank you Taki from everyone at LGR; past, present… and future. May you rest in peace. Antonis Remos is one of the finest singing stars in Greece and undoubtedly one of the favourite voices of his generation over of the last 20 years. His popularity continues to grow whilst sales and personal appearances are constantly in demand. His performance on stage is strong and gripping and without doubt, ascends him to the higher echelons of all Greek singing stars. Antonis Remos concerts sell out in the shortest of times and new releases are always placed high in the charts. The videos of this gifted and charismatic showman are shown world-wide with great anticipation. Once more we will experience a magical evening with Antonis Remos at his absolute best, whilst dancing to his liveliest successes and be singing along with his most poignant ballads. It is with the deepest regret and tremendous sadness that we have learnt of the death of Chris (Takis) Harmanda, former Sales and Marketing Director and co-founder of London Greek Radio, (LGR). Mr Harmanda sadly passed away on Friday 2nd March 2018. He was 59. Chris (Takis) Harmanda was born in Acheritou, Cyprus on 12th January 1959 and was the original founder of LGR during its conception as a pirate radio station in 1983. The date was Saturday, 8th October 1983. Chris was born the second eldest to parents George and Loukia Harmanda from Acheritou and Styllous respectively. The first few years of his life in Cyprus were with his two sisters, Maroulla and Eva, and his brother Tony. In 1967, at the age of eight, Takis came to the UK and grew up in Finsbury Park where he went to Montem Primary School, followed by Holloway Secondary School. During his schooling, he was regularly available to assist at the family fish and chip shop in Finsbury Park, called “Quality Fish Bar” which is still owned by the family after more than 40 years. Takis later attended Dean College, obtaining a BSc in Marketing. In 1983, Chris approached one of his customers George “Akis” Eracleous who was involved in other radio stations and suggested to start a Greek Radio Station for the Greek and Cypriot communities of London to have a voice. Chris persevered until some Greek records started to spin on the airwaves of an FM pirate radio station in London. The public response from the community was phenomenal and with this instant success, Mr Harmanda named the station, “London Greek Radio”. The pioneers from those golden years, Chris Harmanda, George Eracleous and George Gregoriou worked relentlessly to keep LGR on the air. During late-night raids of the-then pirate radio station, enforcement agencies would confiscate broadcasting equipment. However, Mr Harmanda, together with George Eracleous and George Gregoriou spent endless nights, dangerously on roofs of high-rise buildings, relocating transmitters to ensure that the Greek and Cypriot communities woke every morning to the sounds of LGR. With his fellow colleagues, Chris spent over five years convincing British broadcasting authorities for a need to have a licensed station to broadcast to the Greek and Cypriot communities of London. After six years and a great deal of work, London Greek Radio was finally awarded an FM licence and officially joined the airwaves in November 1989. A victory that meant a lot, because this was Britain’s first-ever licensed ethnic station. His roles continued at the station as ‘Sales and Marketing Director’ of London Greek Radio from 1989 to 2007. 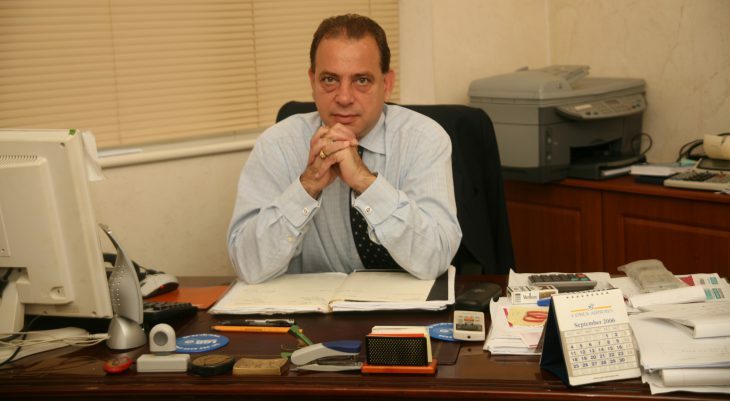 Chris was a very successful businessman, owning and partnering within a wide range of companies in the Greek and Cypriot communities, mainly ‘Home and Away Estates’ in Finchley Central and Cockfosters. With his wife Katia, Chris was involved in many charities helping and assisting those in need for many years. To continue this legacy, Chris’ family and close friends have founded, “The Chris Harmanda Foundation” for his memory and his charitable work to continue. Whilst the foundation is being finalised, a temporary page has been set up, https://www.justgiving.com/crowdfunding/Chris-Harmanda Chris (Takis) Harmanda passed away peacefully on the afternoon of Friday 2nd March 2018. He was 59 years old. Mr Harmanda is survived by his wife Katia David Harmanda MBE; his two daughters Loukia and Eleni; his son in law, Mario; his father Giorgos; and his sisters Maroulla and Eva; and his brother Tony. The funeral will take place on Saturday 17th March at 11.00am at St Mary’s Greek Orthodox Church, 21 Trinity Road, Wood Green, London, N22 8LB followed by a burial at New Southgate Cemetery, Brunswick Park Road, London N11 1JJ. The management and staff of London Greek Radio are all deeply saddened to hear of Chris’ (Takis’) passing and sincerely express their deepest and sincere condolences to the Harmanda family.